Few items of clothing are as versatile and iconic as the blue jean. Billions of these closet chameleons are made every year, many at a cost to the world's once-pristine rivers, lakes, and reservoirs. RiverBlue, an upcoming Canadian documentary, follows renowned river conservationist Mark Angelo as he paddles down waterways such as the Yamuna River in India, the Pearl River Delta in China, and the Citarum River in Indonesia to reveal jean manufacturing's poisonous toll, as well as the impact these polluted waterways have on the people who rely on them most. 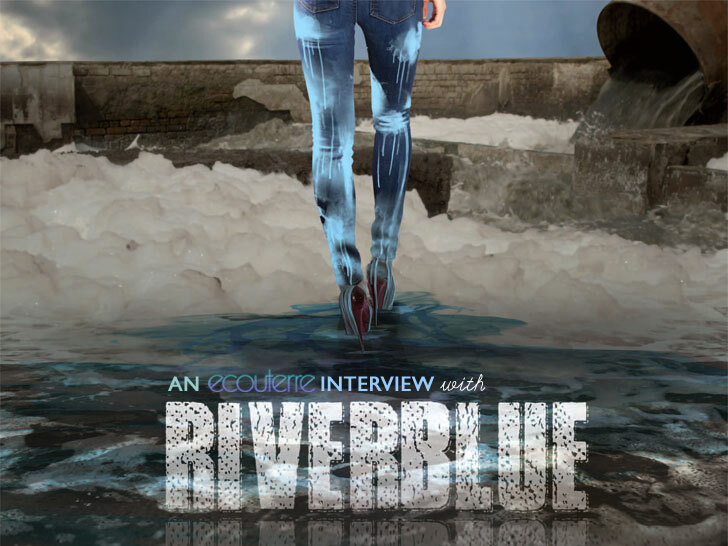 Ecouterre sat down with RiverBlue director David McIlvride to discuss the film's exploration into the dark side of denim. What is the fashion industry—and we humans, by extension—doing to the planet? There’s been a lot of talk about “fast fashion” in blogs and in the popular press and its impact on the environment. With a glut of fashion hitting consumers and low and competitive pricing, it’s not the consumer who is paying for an ever-increasing volume of clothing, but rather the environment. It’s often mentioned that the next war will not be fought over oil, but rather water. I don’t think we have much of a choice. It’s often mentioned that the next war will not be fought over oil, but rather water. I think that’s a strong possibility as we keep growing in population, while at the same time, losing our integral water resources. The rivers are like the capillaries of our planet and we can’t live without them. The planet would die if we lose rivers to pollution. I think the consumer does have a say in the health of the rivers of our world, if they knew the story about how fashion has negatively impacted the environment for decades now. Through social media, pressure put on fashion brands to clean up their act and detox, I’m sure we could have a positive effect on the health of the rivers in many places around the world. No one, in my belief, wants to buy from brands that pollute. What kinds of toxins are we talking about? Blue jeans are much dirtier than you might ever guess. That ubiquitous distressed denim wash is the result of a several chemical-intensive washes. We spoke on camera with campaigners from Greenpeace who when testing the outflows near the denim towns found five heavy metals (cadmium, chromium, mercury, lead, and copper) in 17 out of 21 water and sediment samples taken from throughout Xintang, a city we filmed in. Toxic campaigners in China have discovered heavy metals like manganese, which can be associated with brain damage in the rivers. They’ve also found a lot of heavy metals that are neurotoxic, carcinogenic, which disrupt the endocrine system causing cancer of different organs. Clean water is not only a basic human right; it is the world’s most threatened essential resource. Mark, our world paddler, talks about how he feels that clean water is not only a basic human right; it is the world’s most threatened essential resource. Aside from being critical habitats for wildlife, waterways such as rivers and lakes provide vital resources. Many people rely on this water for drinking, for farming, and for food. Yet we saw, during our filming, over and over again that these vital water sources are often abused by industry and treated as if they are private sewers. The textile industry is chemically intensive. We witnessed a lot of chemicals running through factory floors, eventually ending up in the river. We also documented the spraying of potassium permanganate—without any masks—used to distress jeans, while filming in blue-jean factories. Francois Girbaud, one of our interview subjects and the man who is credited with the stone-washing of jeans and using permanganate in the 1970s, told us that that chemical is killing people. “If people knew that the spraying of permanganate on your jeans to give you that acid-wash look was killing the guy doing the spraying, would you still want that look?” he asks us. Pollution problems that originate in far-off places like China often make their way onto our shores. What we discovered during our filming is that the pollution problems, which may originate in far-off places like China, don’t have to stay there but make their way onto our shores. One toxic campaigner we spoke to on camera recounted a story of how many hazardous chemicals can also be transported in our oceans, atmosphere and food chains and accumulate in places far away from their original source. They have been found to build up in the bodies of animals including birds, fish, whales, polar bears, and even human breast milk. The problem and the solution are therefore not only a cause of local concern. This is a truly global issue. One thing to note is that while we expose the dirty secret behind our blue jeans, we also give some examples of people and technologies that are making a positive affect in the production of blue jeans. The “godfather of blue jeans,” Francois Girbaud, now realizes how damaging the techniques he came up with to give us that ‘lived in, distressed look’ have been to the rivers around the world and is today working with technologies like laser and air to accomplish the distressed look. Both technologies cut back heavy water consumption used in the washing process of blue jeans and also takes chemicals out of the equation. What was the worst of the rivers you visited? For me, personally, the worst place had to be the Citarum River in Indonesia, just south of Jakarta. When we arrived, the river was jammed with garbage, [covered with] green masses of plants, and running black. Chemicals from the textile industry, along with human sewage from bank-side slums, had floated to the bottom of the river and were bubbling up like a witch’s cauldron. There was no aquatic life—no fish—and the men who used to fish the river for their livelihood and for their families now had resorted to going out in small dugout canoes and picking up plastic from the river, which they would take to recyclers in order to make a small income. The river was jammed with garbage, covered with green masses of plants, and running black. I couldn’t believe that a river could ever get this bad and that people were not only bathing in it, washing their clothes in it, but they were also irrigating their fields with this water. I knew that toxic chemicals were getting into the food chain and I thought often of the kids in the small towns we filmed in, who were being fed vegetables and rice that came from toxic fields. That said, when I stepped out of the production van in the Hazaribagh tannery district in Bangladesh, I almost threw up from the toxic smell. It hit you in the face and took your breath away. The smell of rotting animal parts, paired with toxic chemicals running into the river is something I can’t shake even to this day. What kind of responsibility does the fashion industry have towards the environment? The fashion industry as a whole has to be a lot more ethical and environmentally friendly in their production processes than they ever had in the history of fashion. One day, I came across a story that showed a Google map and of an image of a river in China that flowed into a bay that supplied water to Hong Kong and millions of people. The river had a large streak of indigo blue you could see from outer space. 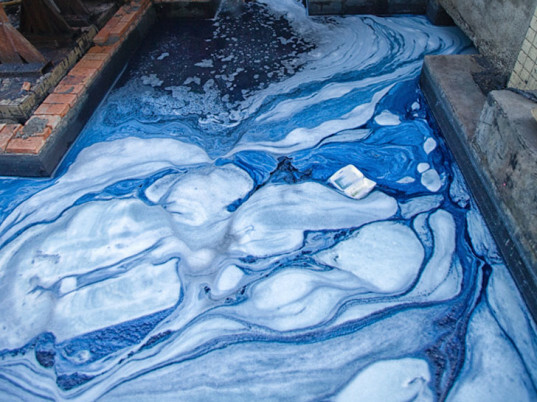 The pollution was coming from an area that billed itself the “blue jeans capital of the world” due to the amount of jeans they manufactured—200 million pairs of jeans per year from 60 different foreign brands—and sent to North America. 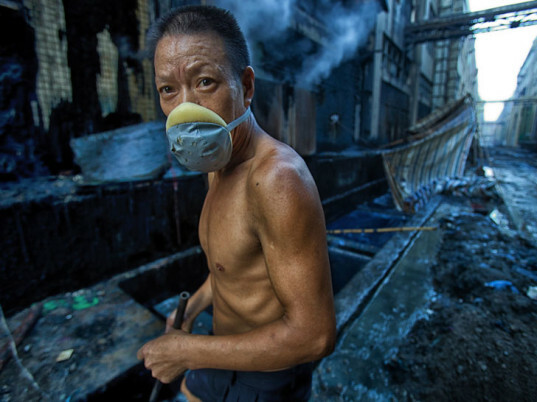 Nine billion pairs of jeans are made every year, in a very toxic way. We felt that a global audience would be familiar with this iconic product—almost everyone on the planet has a pair of jeans—but would be unfamiliar with the toxic manner in which jeans are manufactured and treated and the negative impact jeans have on the rivers in countries like Bangladesh, China and India. In essence jeans would be our “worst case scenario”: the “bad guy” in the story of river pollution around the world. Nine billion pairs of jeans are made every year, in a very toxic way. This manufacturing is killing our waterways and the people that live alongside them. Even though some of the world’s largest brands manufacture their products by outsourcing to countries like China, India, Bangladesh they do have a responsibility for what’s happening to the rivers in those countries. It’s almost criminal in the manner of which they regard one of the planet’s most valuable resources: water. RiverBlue, our documentary is being created to hopefully affect a positive change in the fashion industry. The sooner that people are aware of what is happening and see how they can help, the sooner that we can stop destroying our rivers and harming the people that use them. As a production team, we felt this is time to make a change. What can consumers do to change the situation? In her book To Die For, Lucy Siegle asks the question: “Is fashion wearing out the world?” It’s a valid and important question and I truly believe that fashion is wearing out our planet. Every year, around 80 billion garments are produced worldwide. Incredibly as consumers we know very little about who makes our clothes, or how toxic conditions exist in the manufacturing of fashion. What can we do? Well, we can learn how not to buy for starters. What can we do? Well, we can learn how not to buy for starters. We really have to look hard at our wardrobes and ask, “Do we really need that new piece of clothing?” Another positive step is to start reading labels and buying from ethical brands. As for jeans, the product we all love to wear, start by not washing them as often. Let them mirror your life, and save water and energy in the process. Why use film as a medium for creating awareness? 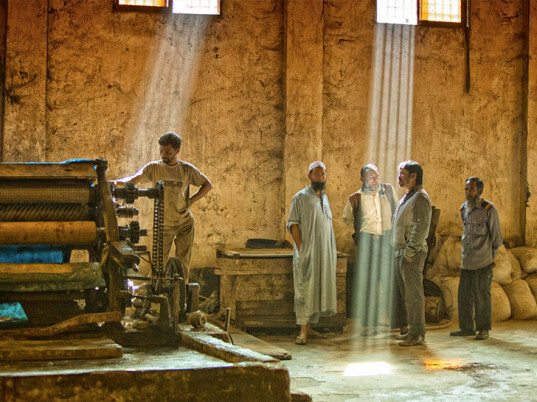 Documentaries seem to resonate with a world audience. There are few platforms where people can get long-form content with an environmental bent. Newspapers are dying, Twitter is only 140 characters, and blogs are short, so we’ve targeted our message to a global platform where people can gather for almost two hours, sit and be immersed in the story of rivers and the perils they face today. We hope that through word of mouth people will begin to talk about the issue and possibly do something about it. 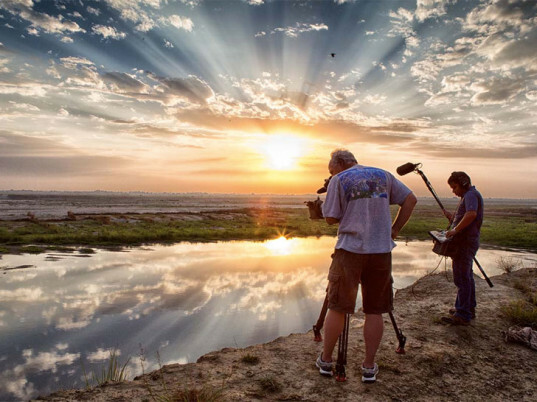 What triumphs and challenges have you faced during the documentary’s production? Undertaking the filming of RiverBlue was a large challenge. We wanted to make it a global story and to travel around the world, spending weeks in each country, takes a lot of money. Our funding came, largely, from individuals who care about the environment and about our place in the world. Our cinematographer and producer, Roger Williams, found the money and also put up a lot of the physical resources to get the story shot. There were people who couldn’t leave as we could, all living in these very toxic place. Physically there were times when filming was tough. The smells, pollution and working conditions were not ideal, but we realized early on that we were only “visitors” in these toxic environments. There were people who couldn’t leave as we could: kids, mothers, fathers, all living in these very toxic places. What remains for RiverBlue’s completion? RiverBlue is moving into the final phases of post-production. We’re looking for a narrator, locking up the final picture, doing color correction, adding music and looking for a distributor for the film. Hopefully it will be out in the late fall of 2014. I think it's great initiative to bring to the fore the textile insdustria in their ways as destructive to the environment and ecosystems. I think it's necessary for your short or trailers must be sub titled at least in the universal language of English to make it more spread over the world to people, towns, communities or countries that do not have an advanced education that teach the English. So may be released by the Net and 140 characters. I represent the Eco'Oribor Foundation and am geographically located in Maracaibo, Zulia, Venezuela. Our hope to help contribute to changing the system. A big hug and greetings to ALL equipment..
Great interview. This is really informative. I hope the film is widely distributed and seen. "The rivers are like the capillaries of our planet and we can’t live without them," McIlvride tells Ecouterre. "The planet would die if we lose rivers to pollution." Since rivers, lakes, and oceans are part of a greater ecosystem, pollutants that originate in far-off places like China have a way of making its way to our shores. One of the worst places McIlvride and his team visited was the Citarum River in Indonesia, just south of the capital of Jakarta. The river was jammed with garbage, covered with green masses of plants, and "bubbling up like a witch's cauldron," McIlvride recalls. If consumers want to effect change, they'll have to learn "not to buy," McIlvride says. "We really have to look hard at our wardrobes and ask, 'Do we really need that new piece of clothing?'"